You know the war of the cupcake store is starting a downward trajectory when a relatively small cupcakery receives a substantial capital infusion. 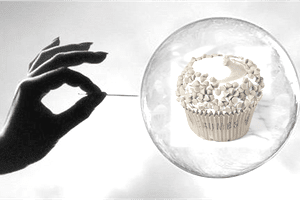 By all indications, "The Great Cupcake Rush" (mirrored in pop culture on the Food Network with the reality hit show "Cupcake Wars) may be slowing down to a more reasonable rate of growth. What that means to food entrepreneurs is that some cupcake bakeries may become sad statistics and cease to exist. The cupcake explosion is so new, industry definitions of the word "cupcakery" are few and far between. They are specialty bakeries that focus on fabulous, extraordinarily and very different versions of the traditional cupcake. The cupcakes are many times larger than the traditional cupcake (or they can be tiny mini versions) and of course are much more expensive, ranging from $3 to $5 or more per cupcake. Mintel, a leading provider of consumer market research published Mintel finds weddings in a recession have fewer bells, all the bliss, saying, "couples are trading in the elaborate wedding cake for individual cupcakes." Cape Cod Lollicakes featured on "The Cupcake Wars," creates wedding cake creations with their bite-sized cupcakes. The actual phenomena of the cupcake trend was an interesting counter-trend to consumers growing interested in healthier options and losing weight. In New York City, for example, you can't walk two blocks without running into a juice bar or salad shop. A few years ago, Crumbs Bake Shop led the cupcake trend. The cupcake bakery, whose signature cupcakes clocked in at 6 ounces and almost 4" tall, declared bankruptcy in 2014, shuttered its shops, and then quickly got acquired and re-opened. Today, they have extended (and re-vamped) their well-known and beloved brand, and the cupcakes, to the new on-trend indulgence, ice cream. A series of premium ice creams featuring cupcake flavors lets people have their cupcake and eat their ice cream too. Affordable Indulgence is the consumer's way of easing the pain of trading-down on purchases. As a pick-me-up, they find indulgent and affordable items that remind them of happier times. Symphony IRI created The Affordability Report specifically addressing the "change in consumer spending (that) is happening faster, more frequently, and is less predictable than ever before… stagnant wages have bred exceptional price sensitivity, resulting in lower demand in many categories." Consequently, shoppers are trading up and down, in some cases buying less of certain products to save money and trading-up on other items, like cupcakes. Cupcakes are an "affordable indulgence" which consumers are willing to splurge on. No matter how tight your budget, you can always get your hands on an extra $5. It didn't take long for retail chains to spot the trend and supermarkets leaped into the upscale cupcake bakery market. The store can use unskilled labor to complete the baking of cupcakes, and the delicious aroma of freshly baked pastries and desserts wafts throughout the store. Supermarkets are where their longer-term business growth will occur. Secondarily, the foodservice market is another segment they will appeal to. Affordable Indulgence is likely here to stay, whether it's giant cupcakes, artisan doughnuts, or cronuts. However, the cupcake wars will settle down to a more sustainable rate of growth which is good for the category and healthy for the consumer.